Gourmet Gardens: Look out for the Tomato Diseases! Look out for the Tomato Diseases! Its that time of year again! Your tomatoes will begin to yield those delicious, juicy, spherical veggies, and it will almost be time to harvest. But wait, lets make sure that your plants are in tip top shape and your harvest doesn't have any disease. We'll go over some of the more popular tomato diseases here and tell you exactly what to use in order to prevent them from destroying your plants! One of the most obvious diseases that will affect your tomatoes is Anthracnose. This fungus is very easy to spot, as it is causes sunken pits in the vegetable and eventually causes it to rot. There is also a black spot that will develop on the skin where the veggie has sunk. One of the best ways to rid the tomato of this fungus is to use copper spray on the plant and to ensure the tomatoes avoid contact with dirt as this is how the fungus is spread. Another issue that tomato plants face is Early Blight. Unlike anthracnose fungus, this disease attacks the foliage of the plant instead of the vegetable itself. It will show itself as dark spots with rings on the older leaves of the plant, then move to the younger ones. This will eventually cause the leaves to die, and expose the vegetable to sun scalding. This disease is soil born, meaning that the best defense is to remove infected plants immediately, and ensure that all fallen foliage has been cleared from the garden. As well, copper sprays will eliminate the disease. Tomatoes can also experience problems while ripening. A disease called grey wall attacks the tomato while it is still green. The vegetable will show signs of grey spots in the skin. The ripe fruit will have green or brown areas within the tomato. The best way to defend against grey wall is to ensure that your tomato is getting enough sunlight and an even distribution of water and fertilizer. 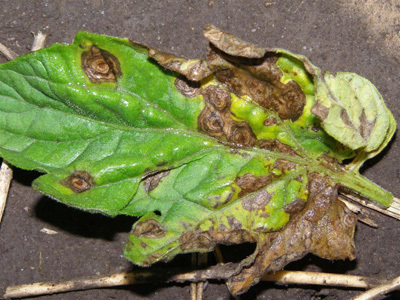 Disease in tomato plants is not uncommon, but with proper care, it can be avoided! One of the nice things about owning a Green Gourmet Garden raised planter is that they keep your garden off the ground and ensure that a perfect level of soil and fertilizer is achieved. So what are you waiting for? Get out there and grow some of your own healthy tomatoes!